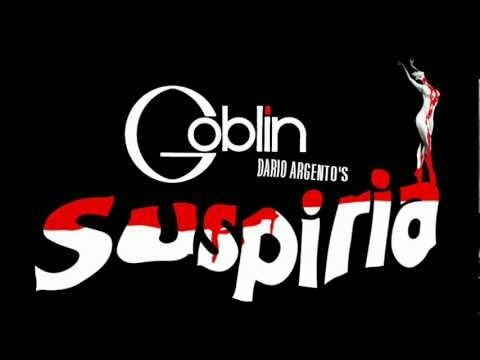 On Friday the 19th of July, I flew from Dunedin to Auckland to see Italian prog-rockers Goblin perform their score for Dario Argento’s Suspiria accompanying a screening of the film, as part of the New Zealand International Film Festival. Here is my report. 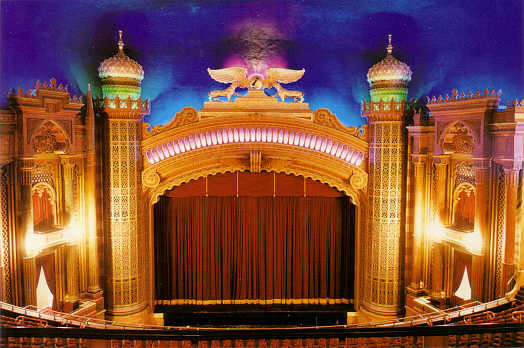 First off, the Civic Theatre is, in my opinion, the single most beautiful picture palace I personally have been to. 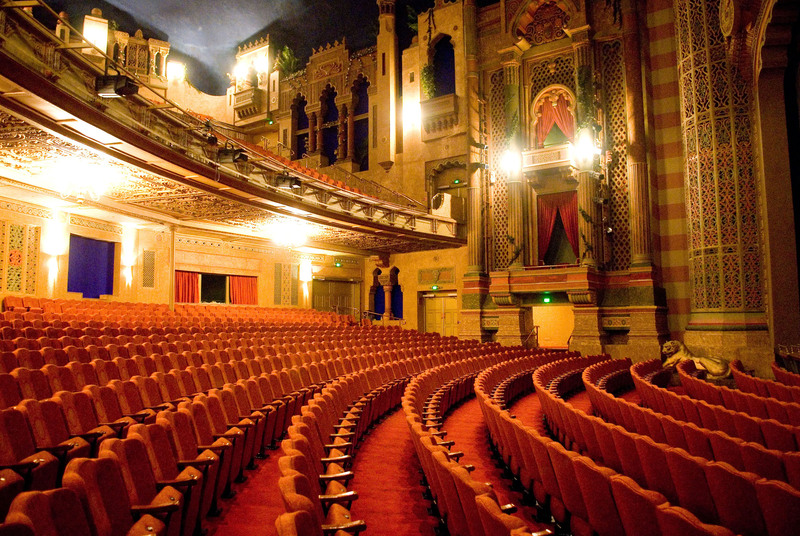 The Regent in Dunedin is gorgeous, of course, but for me the Civic tops it, with the spires, the intricacy of the detailing, and the starry ceiling. It is, then, a near perfect location for a movie with live accompaniment. Suspiria (1977) itself is one of the great horror films of all-time: an idiosyncratic, even iconoclastic masterpiece. Argento is a towering figure of the European horror film. He followed in the footsteps of Italian maestro Mario Bava, whose films set the most immediate precedent for Argento’s delirious aestheticization of horror conventions. Though Bava pioneered the giallo, he is equally known for his supernatural films, particularly Black Sunday (1960); Argento is best known as a maker of gialli, but Suspiria is a different thing. Gialli are, in the main, riffs on the slasher-predating violence of Psycho (knives being the pre-eminent choice of weapon), combined with intricate, twisty thriller plots, influenced by a different set of Hitchcocks (and macabre thrillers like Mad Love, The Black Cat, The Raven, and Hangover Square; films by Lang and Clouzot; and paralleling Franju). In the core case of the giallo, there is not only a fully human killer, with no supernatural properties, but typically an at least nominally rational motivation for the crimes (monetary gain, for example), even if committed in the guise of serial killing. When the giallo killer is psychotic, he is provided with a backstory and coherent explanation, as in Psycho. When the giallo’s indulgence in gore began to feed into the slasher film, the supernatural dimension (Michael, Freddy, and Jason are all unusually difficult to kill) was matched with a markedly more irrational, alien motivation: pure psychosis, blood lust, hatred- in short, not just perverted sexuality, but evil. Early Argentos like The Bird with the Crystal Plumage, The Cat o’ Nine Tails, Four Flies on Grey Velvet and Deep Red were baroque, gruesome, sadistic thrillers, among the finest of the gialli. Suspiria, though, is an Argento moving into something quite different. With Suspiria, Argento follows the more excessive tendencies of Deep Red into pure delirium. This is cinema where the plot is secondary at best: Argento here is playing with stylization and excess, lapsing into incoherence so as to better create a dreamlike effect. He achieves an oneiric lyricism in nightmarish worlds where the most primal horror might rage at any moment; like so much of the best horror of his era, one feels one is in the hands not of a cold, precise, and masterful narrator (like Hitchcock, and even De Palma and Cronenberg) but of a madman. Storytelling as such is irrelevant to the Argento of Suspiria, and Tenebrae and Inferno following it. Any felicities or complexities in that regard would constitute little more than a distraction from production design, composition, camera movement, sound, extreme violence, pounding music, high-pitched performances, and outlandish situations- in short, the pursuit of pure sensation. Given this, a live performance accompanying the film by Goblin, the composers/performers of the original score, is a perfect fit. 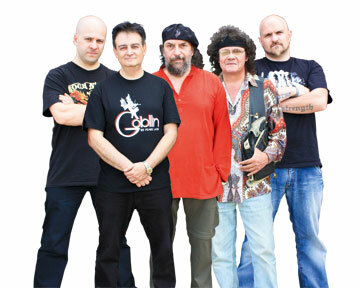 (This version of Goblin includes three original members, Claudio Simonetti, Massimo Morante, and Maurizio Guarini, alongside newer members on bass and percussion.) With a more complex narrative, the cacophony of a 5-man Italian progressive rock band would overwhelm and obscure the storytelling. But in the context of a film going for surreal, nightmarish sensationalism, their impact creates an immersive experience. Though they did a few other albums, they specialized in soundtracks, and where much Italian prog-rock was heavily indebted to Emerson, Lake and Palmer- and tending to operatic effects, if with fractionally less bombast than French prog-rock- Goblin’s Suspiria score has a stronger affinity to krautrock: their music is based on intensity and repetition (a perfect fit with the requirements of the motion picture soundtrack). They produce such an encompassing, relentless wall of sound that it is fascinating to have a chance to witness them doing it. Their work on Suspiria is laden with enough sonic effects that to be able to pick out what sounds are made by keyboards, what by the bass guitar, what by acoustic guitar, what by bouzouki (one of the main instruments! ), and what by a stage-filling array of percussion is revelatory. And yeah, the impact: they are pummeling on video versions of the film. A few meters in front of you, in front of an enormous screen playing a 35mm print of Suspiria? You are pinned to your seat. It is most certainly not something you should miss if you can help it, and if you truly care about the cinema. Moreover, one cannot but be chuffed for them: touring around performing your best-known work to big audiences is an undeniably sweet gig for aging Italian prog-rockers. When was the last time you saw the musicians in the band take photos and video of the audience at the end of the gig? (You’d never see Billy Corgan doing that. His contempt for his audience- by itself enough to ruin a gig- is such that once you’ve paid for your seat, you get the sense he’d just as soon see you under the wheel of a bus.) Yet this is just what Goblin did as they received their applause. It was sweet. That audience, however, was the rub. The people doing the applauding were also the ones preventing this from being the kind of immersive event it could and should have been. They were a blight on the evening. Simply put, this was an audience largely composed of total douchebags. Now, one might posit a number of reasons why this was so. Firstly, any country’s financial center is sure to have a high level of douchebaggery, and Auckland indeed has a reputation as NZ’s Douchebag Capitol. Secondly, one friend told me that Auckland has a culture of laughing at horror movies. Having had no experience of screening organizer Ant Timpson’s bygone Incredibly Strange Film Festival, I can’t say, but expectations from that might have been a factor here, in which case Timpson probably ought to take some of the blame for how the audience approached Suspiria. In any event, bringing an Italian prog-rock 5-piece down to play necessitated filling up the Civic to offset costs, which therefore necessitated this screening being pitched as a big event, which in turn likely brought in a number of viewers who had no idea what to expect, and no affinity for cult horror cinema of the 1970s. Nonetheless, what was truly enraging about this audience was their evident smugness as they laughed and jeered at the film. This was a film-festival-hipster douchebag audience, a pretentious douchebag audience, and thus the worst kind. Their inability to grasp what Argento was doing was matched by their sense of themselves as smarter and more sophisticated than the film. It was as if they thought, Oh, I go to the film festival, so I’m an educated, cosmopolitan viewer. But they laughed at the film’s lack of realism- Hahaha! That’s not real! Hahaha! Blood doesn’t look like that! Hahaha- that exposition is rather clumsy! Hahaha- this film is dubbed! The current dominance of small-scale realism in the indie and arthouse cinema seems to form their horizon of expectations of what cinematic art should be. Hitchcock called such people The Plausibles: Hahaha! That’s not plausible, so it’s funny. In fact, however, this pseudo-sophistication is little more than a cover for a profound parochialism: realism is one thing the cinema can do, by no means the only thing. But Argento doesn’t care about verisimilitude. He isn’t aiming for subtle storytelling, so laughing at Suzy’s voiceover about counting the number of steps the teachers take is simply making something of nothing. Blood never looked realistic before the ‘80s (and why should it? why does that matter?). All Italian films, at least of this period, were dubbed, so, again, this is not worth commenting on. This was an audience that utterly failed to engage with the film on its own terms, that utterly failed to approach it with anything but ignorance and philistinism masquerading as sophistication. The audience treating the whole event as an episode of Mystery Science Theater (which I would argue has generally been a baleful influence on the reception of disreputable cinema), yelling things like “Take five years why don’t you?” as the student stacked suitcases to escape from the killer through a window, in what I’ve always found a gripping scene, came close to ruining the whole experience. Just as comedies may benefit from being seen with an audience, this showed just how profoundly an audience of braying, ill-educated cretins, utterly deluded about their own acuity, can ruin a horror film. That they didn’t is testimony to the artistry and considerably greater intelligence of both Argento and Goblin. So if you happen to have a chance to catch this bill, be ready for them. Try to get into a zen state of acceptance of the pitiful ignorance of self-congratulating hipsters- otherwise, you’ll end up killing someone, and while ridding the world of another one of these people might be a good thing, it does mean you’re likely to miss the end of the movie if you do. Thanks to Chris Dumas for “the Plausibles.” Thanks to Lydia Randall for the “take five years” quote. Very special thanks to Logan Valentine for getting the tickets, serendipitously far enough away from people actually yelling at the screen that they were not in hitting distance. And naturally, all of my friends in attendance are exempted from my ranting. Glad you attended but for the record I didn’t encourage any MST style theatrics and if you know my background at all with film exhibition for the past 25yrs.. I actively beat down and destroy people who ruin the film experience. Ask anyone who comes to my 24hr movie event each year. It was unfortunate that some chose to snicker at the film instead of immersing themselves but sometimes you can’t always control a cinema audience. It’s an organic beast that rules its own roost. And sometimes it’s worse to try and fight it – you make it worse for yourself and for those you are with. It’s like getting a rage on for a chip packet rustler.. you end up so furious, you ruin your own night. I know how frustrating it can be, believe me. I’ve gotten into violent confrontations in cinemas all over the globe but I also acknowledge the power of audiences and that we need them, even when they do stupid things. Even with the assholes, I still loved the experience and spoke to them about other films we could possibly do down the line. Thanks for the comment, Ant! It was a great event regardless of the audience, and infinite thanks to you for making it happen. 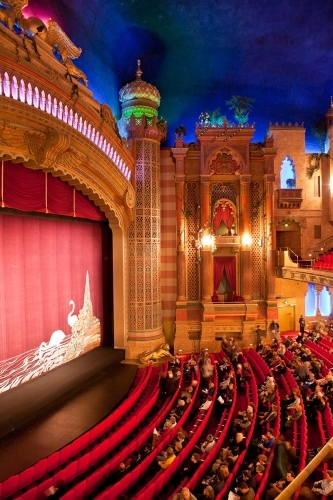 I had never been to one of your screenings before, so I was merely speculating there on the culture about the Incredibly Strange film events, cued by this review: http://www.witchdoctor.co.nz/index.php/2013/07/goblin-perform-suspiria-civic-theatre-auckland-friday-july-19-concert-review/ But I’m happy to take it back. And indeed, the audience did not succeed in ruining a fabulous night. I would simply wonder aloud if it would have been worth saying something about Suspiria’s dream-logic. Incidentally, I came up to Auckland for that screening alone, and, again, it was well worth it.